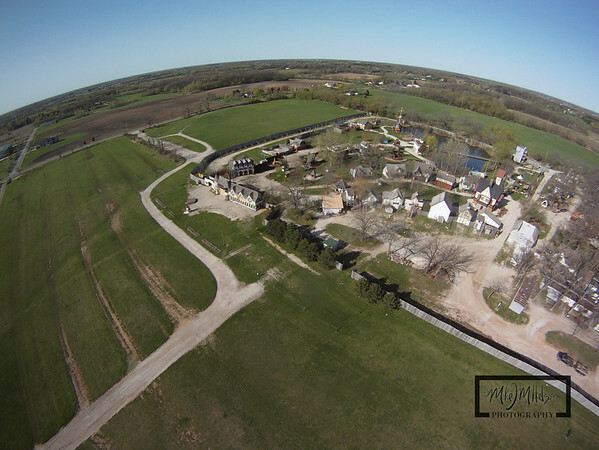 I am trying to get a handle on Search Engine Optimization, SEO for my photography website. I have thousands of images posted on my m2 photography site, and it's very difficult to get them to show up on Google. However, many times the same image posted on flickr, or linked from my blog, or external forums do show up in the results. I want to ensure that I'm doing everything possible to improve my ranking, and maybe gathering some ammo to take back to SmugMug for enhancement requests. There are forums specifically offering advice for optimizing your SmugMug site, and I have taken many of the tips and implemented them without seeing many changes in my searches through google. I thought I would perform some simple tests to see if any of my methods are working. I have recently uploaded some of the same images to both flickr and my smugmug website. I will link to a couple of them here to provide some inbound links to the images. You'll notice that I've been using as many hyperlinks in my post as possible, linking both to external sites and also back to my SmugMug and flickr accounts. It seems as though Google ignores the keyword meta tag, so visible content is king. Having other sites, such as this blog, facebook, and forums link back to your image is also very important. In addition to this blog, I will be posting links to the same images on facebook, and a couple of forums including dgrin.com, photography on the net, and also the Kite Aerial Photography forum. The images on SmugMug and flickr have the same keywords, as well as this blog post. The file names are the same, but the titles on flickr have been changed. The description field for the gallery in SmugMug is similar to the description of each image in flickr. I tried to modify the caption in SmugMug for each image in the gallery, so that it's not using the same language for each similar image. SmugMug does not allow sitemaps, which is a huge disadvantage in the SEO game. I will monitor the Google Analytics for my m2 Photography website, as well as perform simple search queries using Google to see what happens, and post my results here. Day 1: Less than 5 hours after posting the original images, one of my images from flickr shows up as number one in Google when searching on "Bristol Renaissance Faire Aerial", which is pretty specific to my image. A few hours later, the first three results on Google are from flickr. Day 2: I did another google search this morning, and the results are starting to get interesting. The number one returned item was my photos on flickr, but returned from a site called flickriver, which just displays flickr images with a different skin. The 3rd, 4th, and 7th, search results were all direct flickr links. The 2nd page of search results, at number 15, brought up my testing post regarding this issue on dgrin.com. Day 4: 1st page, 4 flickr/flickriver results. 2nd page, Facebook, Dgrin post, and blog results. No SmugMug results up to 10 pages in. Day 5: 1st 2 results are flickr. 3rd is my blog. 4th and 5th are flickr. Second page reveals dgrin and facebook. No results for SmugMug found. Instructed by SmugMug to modify setting in Gallery so Google can find Gallery. Not exactly sure why this setting was off, as it's default is on, and other galleries were set this way. This setting is called "Hello World!" I made the change and have waited a few days to see if the results were any different. Day 9: Flickr ranked 1 and 2. Blog moved up to 3rd position. Flickriver at 4 and 5. Page 2 of search results have Dgrin, Facebook, and Dgrin. Page 3 has my blog again. No SmugMug results found. After 2 weeks: Flickr, Facebook, Dgrin, Photography on the Net, and KAP forum all returned results in the first 3 pages from Google. Nothing from SmugMug. My findings confirm what other users have been complaining about, and that the structure of the programming at SmugMug fails at providing any legitimate method for SEO. Unfortunately, they seem to re-hash the same links from dgrin on how to improve your rankings, which doesn't work. They need to realize that other sites have figured this out, and maybe, just maybe they need to take a step back and try something new. SEO is not an exact science. SmugMug is create for customizing online galleries. If you want people to search and find your images through Google, use something else. Apple iPad with Custom Vinyl Skin! Although I have a Motorola Android phone, and anticipate the release of the wePad with Android OS, I broke down and bought an Apple iPad on the launch date. I anticipate using this not only for web browsing and e-mail, but actually for photography. The ability to copy a portfolio of images to the device and have them appear on the specatular iPad screen will help sales and also be a nice novelty at weddings. After getting a few hours of tinkering with it, I desicded that I need to create a custom vinyl skin for the back. I dug out the vinyl cutter from the basement and also the flatbed scanner. I scanned the back of the iPad, and created a template in Adobe Illustrator to cut out the Apple logo and iPad specs. 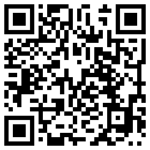 I then added my photography logo vector art and my contact information. I realize that this won't prevent thefts, it will at least keep honest people honest. Hopefully, the vinyl skin will also help protect the back from scratches. I will need to be careful until I can get a decent sleeve to carry it around in. 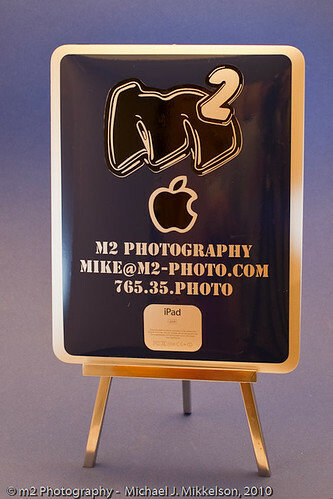 Custom Vinyl iPad skins can be obtained from m2 Photography for $40 single color, and $50 for 2 colors, and have any design you want. 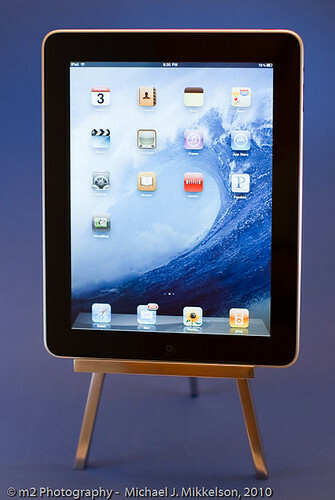 ** Contact mike (at) m2-photo.com if you are interested in a custom vinyl iPad skin. ** Design must be submitted via vector format, or be a standard font. What do I think of the iPad? It is really nice for surfing websites, at least the ones that don't require flash, and checking e-mail. Coming from the Android Market, spending tons of cash on apps will take some getting use to. I bought 2 apps, one for sketching and one game. The interface is nice, but I'd like it to be more like the android where I can customize it. The sample book on the backlit screen was easy to read, and will be nice as an e-book reader, or for magazines and multimedia. The Netflix app is great, as you can watch instantly right on the iPad. outside the ridiculous price for the device, I'm very happy so far with the purchase, as least until the wePad comes out.